A quart of wheat for a day’s wages, and three quarts of barley for a day’s wages. After the tempest, I put on my Muck boots and headed out to assess the damage. Most of my crops were fine, but I wanted a closer look at my grain plots. Lodging, which occurs when top heavy grains get knocked over from heavy rain and winds, can devastate a crop and make harvesting the grain next to impossible. 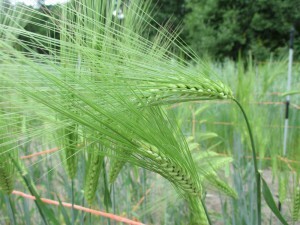 This year, I am trialing a number of heirloom barley varieties as well as ancient wheat varieties. I do tie most beds up with stakes and twine around the perimeter to give added support, but extreme winds can break the stems, rendering the grain heads worthless. 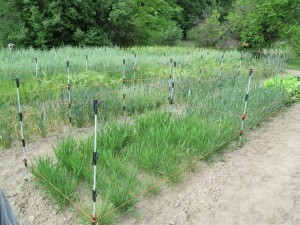 To my delight, all the trial plots as well as the larger plots of grain (oats, barley, wheat and corn, etc.) were in good shape, given the battering they had endured. My goal, is to find some excellent, food-grade hulless barley varieties as well as ancient wheat varieties that will grow well here in Northern Indiana. Our climate is not optimal for wheat and barley (some is grown locally, but mostly for straw and animal feed) as most of the barley and wheat we consume is raised out west and in Canada. This has a lot to do with temperatures and humidity levels. If the trials are successful, my plan is to grow them out in larger plots next season and begin to offer seed. I wanted to highlight a few of these unique culinary specimens to whet your appetite, that is, if the prospect of locally grown heirloom grains is as exciting an idea for you as it is for me. All of the seed for the following varieties was obtained from the KUSA Seed Society, an organization in Ojai, California dedicated to the preservation of ancient grains. I can not say enough good things about them. What if Everything You Knew About Grains Was Wrong?